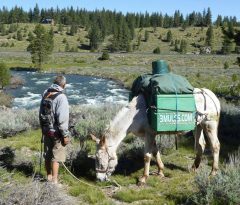 After spending 11 nights/12 days as guests on The Wildlands Conservancy’s Wind Wolves Preserve, the 3 Mules are back on the road. Back on April 9th, we were going on 33 North towards Bakersfield, in which we first looked south and were enticed by the mountains in Wind Wolves Preserve. It’s a big area at 93,000 acres, the West Coast’s largest nonprofit preserve, in which you don’t see any buildings or any roads, so naturally we thought it would be nice area to go into as we continued on our way to Bakersfield not really expecting to ever go there. On April 14 as we were along 99 heading on our way to Sacramento and south of McFarland, Who-dee-doo decided that he was going to roll onto his back. He rolled right on top of the pack saddle, which was on him, and broke it in half. At that point, I was stranded and couldn’t go anywhere since I need a packsaddle to put my pack boxes with supplies on it. We posted on our 3 Mules Facebook page to see if anybody could bring a packsaddle to help us out. Backcountry Horsemen of Kern Sierra Unit responded and brought us a packsaddle and got us back on our feet. The gentleman that brought it said that they were putting on a ride at Wind Wolves that upcoming Saturday and invited us to go there and be a guest for that ride. We accepted and thought it would be a great chance to see Wind Wolves, which we never expected that we’d get. We packed up and headed back to Wind Wolves, which was about 60 miles from where we were. On April 19, the 3 mules meeting up and riding with the Backcountry Horsemen in Wind Wolves Preserve. The Backcountry Horsemen of Kern-Sierra unit also gifted us a membership to their chapter. For that, the Mules are truly honored. At Wind Wolves Preserve, we were treated very nicely by Dan York, Vice President of Wildlands Conservancy, Landon Peppel (Wind Wolves Preserve manage), Matt Thorp, (Wind Wolves Preserve ranger), Courtney, Melissa, Sarah and the other staff at Wind Wolves. We stayed here for 11 nights/12 days where the Mules explored the canyons and grazed every day. This is a very peaceful place where we were woken up every morning by the sound of birds and lulled to sleep the sound of crickets and frogs. At Wind Wolves, in addition to the mules re-fueling, the mules got re-shoed and fitted with the new Easyboots that were delivered to us. Thank you all that helped donate an EasyBoot so that we could get back on the road. Who-dee-doo allowed the EasyBoots to be put on his hoofs, but he still does not allow us to shoe him on his blind side. The Wildlands Conservancy mission is to “preserve the beauty and biodiversity of the earth and to provide programs so that children may know the wonder and joy of nature.” The Wildlands Conservancy owns and operates California’s largest nonprofit nature preserve system that includes”12 magnificent landscapes spanning over 145,000 acres of diverse mountain, valley, desert, river and ocean front properties. The Wildlands Conservancy purchases and restores landscapes and builds national park quality visitor facilities that are open to the public at no cost. Once again, thank you to the Backcountry Horsemen of Kern Sierra Unit and The Wildlands Conservancy for providing the opportunity for the 3 Mules visit and stay on The Wind Wolves Preserves, a place we never imagined of ever visiting but wanted to.